A dog ban is in place on Portreath beach between Easter and October. Local towns and villages to visit..
Sea Fishing in Newquay from the Camel Estuary and beach at Perranporth. 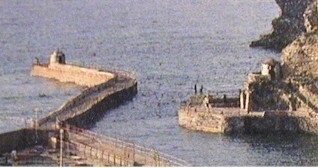 Shark fishing can be arranged from Newquay. Sailing on the Camel Estuary. Harbour authorities should be consulted about off shore sailing. Newquay is the main centre. Surf-boards can be hired on all the main beaches. Championships are often held at Newquay.